In September Foreign Policy there is Julia Ioffe's important article "The Pentagon Is Preparing New War Plans for a Baltic Battle Against Russia." This blog looks at security in Nortern Europe in a comprehensive perspective. During the Cold War or immediately after it Northern Europe did not make many headlines in security policy. However, recently there has been certain escalation of military exercises and also some alarmist commentaries like those of Edward Lucas. Therefore it is useful to have a look at the fundamentals of the region. 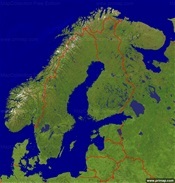 The traditional East-West conflict in Northern Europe dates back to the 12th century when the Western and Eastern Churches extended their competition to the high North. The last but one resolution in this history took place in Teheran in December 1943. Among other things Roosevelt, Stalin and Churchill agreed there on the Northern state borders as well as on broad outlines of the Soviet quasi hegemony on the Baltic Sea after the war. It is not widely known that also after the Cold War there was an explicit agreement between the US and Russia on the new place of the Baltic states in the Northern order. In March 1997 President Clinton and President Jeltsin met in Helsinki and they found an agreement on NATO membership of these countries. Before that there had been in the West doubts about the NATO membership of the Baltic states due to their vulnerable geography. There had also been hopes that Finland and to Sweden would take care of their smaller Baltic neighbors. However, advised by their long history and by staying nonaligned but without binding their hands these two countries helped both the US and Russia to accept the new Baltic arrangement. In the historical perspective the established post Cold War order in Northern Europe is the best ever for its small, independent and democratic states. From the view of "Europe free, whole and in peace" there is nothing new to be gained in the Northern Europe, except further strengthening the stability of its present order. The North European stability is based on the post Cold War structures of the region. All Western countries except Norway are EU -members and all except nonaligned Finland and Sweden are NATO -members. In addition to this there are also the credible level of Finnish national defense as well as Finnish and Swedish NATO and Nordic -partnerships. In this framework any Eastern or Western effort to benefit structurally at the cost of the other is bound to develop political chain reactions creating costs also to the first mover itself. On political level this seems to have worked well both as deterrent against shaking the boat and as an incentive for moderation and stability. However, on the military-operational level there has been first slowly emerging and recently more visible escalation of exercises and demonstrations of force in Northern Europe. Their early origin was primarily in the developing Cold War geopolitical circumstances in the region, but it goes without saying that today both Russia and NATO see the escalation on their current broader strategic maps. Watching the Northern strategic map from the West, you can see like Zbigniew Brzezinski in a recent Senate Committee hearing the Baltic states as isolated territories next to Russia, easy to take over and difficult to take back through "Normandy like" operation from the West. And from this local fragility you can calculate certain strategic vulnerability of NATO as a whole. And watching the same map from Russia you can see NATO in the Baltic countries at arm's length from St. Petersburg as well as NATO capable to block any commercial maritime communication from the same city or from the Western part of Russia. So also here you can calculate from military tactical situation to strategic vulnerability of a the "second capital" and of whole Russia. So if analyzed separately, the Baltic states for NATO and the St. Petersburg region for Russia may look quite vulnerable. But if seen on the same real map together they are like powder barrels side by side: threatening your opponent here will backfire to yourself. You can speak of a regional deterrence or mutually assured damage - already on a hybrid contact level. Needless to say that any crisis on the Baltic Sea is not just a tango for two. You are dealing with a region of some 90 million people in ten countries and the exports and imports of their economies on a sea, where every day some 2000 vessels transport different kinds of cargos. These observations have and must have had in several capitals several conclusions. First, whatever the problems in different parts of Europe or of the world it is a common interest from St Petersburg to Hamburg as well as to all relevant capitals to keep Northern Europe out from any horizontal escalation from any other region - a thinking that on the basis of some recent American and Russian high level statements seems to be applicable to the Arctic region. Therefore also an active stability policy to strengthen the North European stability is in everybody's interest - and it is expecting also pro active initiatives. Thirdly, even in times of strategic tension between the parties, a full government backed regional-tactical level communication between the military professionals is vital in order to avoid misunderstandings and to prepare the turning of force demonstrating escalation towards de-escalation.